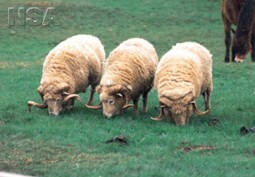 Portland Sheep are a heathland breed from the Dorset area of the UK – not Portland Oregon or Portland Maine - and a representative of the tan-faced group of breeds from the South West. It is a small animal, the average adult ewe weighing 38-40kg. The legs are an even tan color. The face is a tan color but may have lighter areas around the eyes and muzzle. Some sheep carry a light covering of wool on the forehead but the rest of the face is free from wool. The horns of the ram are heavily spiraled; in ewes they curve through a half circle.